Hardgainer tips are pretty fundamental. You must adhere to hardgainer workouts and a hardgainer diet to get bigger muscles. You must be able to look long-term and NOT expect to build muscle fast. "Hardgainer" is a term first coined by Stuart McRobert over 20 years ago to describe guys with poor genetics who wanted to put on muscle WITHOUT using steroids. In order to do so, they would have to resist training like professional bodybuilders or those that are genetically gifted. Their workouts would be characterized by brevity, intensity, and consistency. His ideas on hardgainer routines and a hardgainer diet put to rest the theory that the guys with the biggest muscles know the most about building muscle. His hardgainer tips are few, but they have stood the test of time. What is a hardgainer? Are you one? A hardgainer is someone who finds gains in size and strength extremely difficult to achieve. * Hardgainers have been at "sticking points" for years. 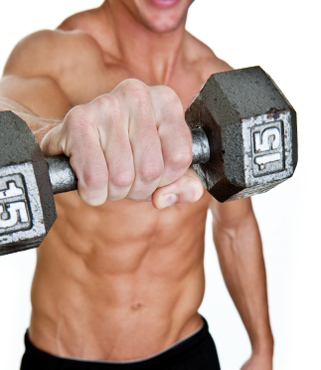 * Hardgainers are normally characterized by small wrists and necks. * Hardgainers show improvement in their lifts very slowly. * It is very difficult for hardgainers to bench over 200 lbs. * It is very difficult for hardgainers to squat over 250 lbs. * Hardgainers need more recovery time between training sessions. 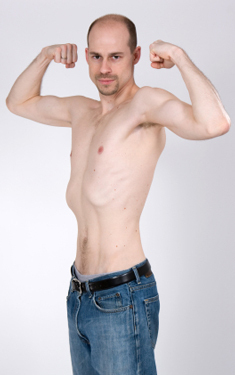 * Hardgainers can put on fat easily, but not muscle. * Hardgainers must watch their diet. * Hardgainers must also use interval training cardio to get results. * Hardgainers must realistically look at gains in terms of years...not weeks. * Hardgainers can easily overtrain. You must look at yourself realistically. If you have been training consistently and intensely, doing your best to increase both size and strength, yet being frustrated with the extreme lack of progress...you are probably a hardgainer, and will have to radically alter your workouts. Yes, you can build bigger muscles, but you will have to train much harder and more intelligently than guys who are genetically gifted or using pharmaceuticals. It will also take you longer to see results. * Hardgainers normally train two times per week, rarely three. * Hardgainer workouts last less than an hour and are total-body. * You will normally use 2 easy warm-up sets and 2 intense "working sets." * All exercises will be compound multi-joint exercises. * Your exercises will be selected from: benches, dips, military presses, squats, deadlifts, pull-ups, lat pulldowns, shrugs, and side bends. Calf raises may also be added. * Look to increase the weight you are using by 3% - 5% every three weeks. * You will do different exercises on different days, but you will get a whole body workout. * Use whole food protein sources (turkey, fish, chicken breasts) in your diet. Do NOT gulp protein shakes. * Stay away from sugared and processed food. Eat more vegetables and fresh fruit. * Your workouts will also include interval training to help you burn belly fat. There is no possible way I can do justice to the topic of Hardgainers. 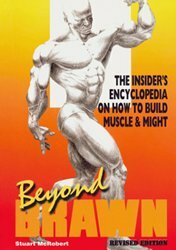 You will be best served to checkout Stuart McRobert's book, Beyond Brawn from your public library or purchase a copy.